in reply to second chance did not see any of today's auction. 674 was the steal of the sale . purchased by a very astute judge. Was in the wrong sale would have been much much dearer in Melb P2 or Adelaide. I have left a message with purchaser re a share. Lot 609 presents a conundrum for me Visually impressive but I am very circumspect ! Looks like a nice 3yo type - hence I was asking whether there’s something wrong with her from another angle, or if the sire/3yo types are not in fashion. any opinions on lot 362 ??? There appeared to be a seismic shift in the nature of this sale in 2018, which coincided with it being the first sale in the new Riverside complex. Average for Book 1 was $93K, up from $71K the prior year. As a result they have extended to 1,000 lots by adding a "Highway Session" on 14th February. It's an important sale for me as it is the first time I've offered a yearling at a Major Sale - a bit of a bucket list moment. I am very much hoping the Highway Session holds up and is like the old Summer Sale where trainers bought more on type than page. It's going to be a nervous few months. Trainer friend was interested in a filly which was subsequently knocked down to him, however an adverse endoscopy resulted in the sale being quickly voided. Had a vendor (QLD based) say xrays & scope were all good. Had the filly vetted & comes out with an issue on xray but also a Grade 3 scope! Never trust that vendor again & a few know about it too! Yep - and a result that, on balance was pretty good. Yesterday was a very stressful day. I went to the races on Wednesday expecting to see a vibrant sales complex full of provincial and country trainers inspecting horses, but nothing could have been further from the truth. You could have fired a gun through the Riverside complex. At this point vendors became very worries, especially after the softness towards the latter stages of the main sale. Some withdrew their lots on Wednesday evening and many more spoke about it. Come sale time at 10:00 yesterday morning, there were more horses than buyers and the buyers that were there were sitting on their hands, causing horses to pass in and then seeking to negotiate with what they were hoping was a desperate vendor. Those buyers that were there were looking for trade horses for Asia and/or ready to run types, and a big, gangly Roman Emperor wasn't going to fit the bill. Lovely colt but needs time and the buyers there didn't have it. I revisited the reserve to what was reasonable and then in the sale used the trick rem286 referred to above by putting him "on the market" below the reserve to get a few more bids. It partially worked and at the 13K he is more or less a break-even result. 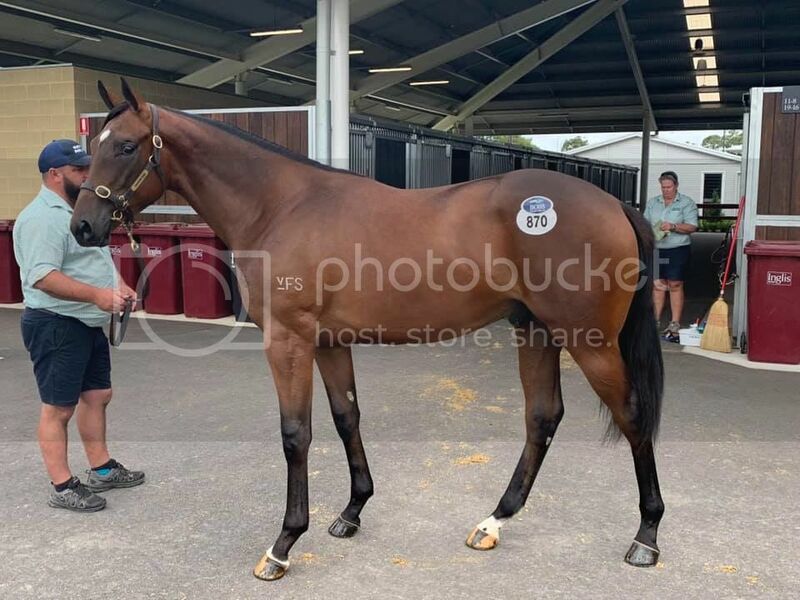 What is particularly pleasing, however, is that Michael Hickmott bought him and he will be trained either by Michael or his brother Robert. Michael said that he will geld him and then turn him out for twelve months, which was music to my ears. So he goes to a good home that understands how to train horses to get a trip and gives the mare every chance. To my mind, that's worth more than a couple of extra bids in the sale-ring. It was an interesting experience - great to be on the other side. Not great for the blood pressure, though. Mentioned to the other half that you and many others would have been sh1tting bricks given that the bottom had fallen out of the market quite some time earlier. Great to see you were happy enough Robbo, if not exactly ecstatic. Thanks mate. I must say that the market (and indeed the atmosphere) did improve later in the day as more trainers arrived. Whoever put barrier trials on at the same day as the sales needs to find a new job. Whilst i may not be a major player the mere size of the sale did my head in. I reckon Shrunk is correct. Last year's Classic sale was the first at the new Warwick Farm complex, and Inglis spent huge money promoting the sale plus they also extended far more lenient credit to buyers than they had before. And the sale was a huge success. This year there hasn't been so much hype, and credit back to normal. On top of that they have 200 more in this year's catalog which has diluted pedigree quality, and I've been told by quite a few sources that the quality of yearlings is extremely mixed. All those factors have appeared to have negatively affected sale prices. Have never seen so many sold in the $15-30k range, compared with last year when the bottom of the market was quite a bit higher. this week. Lots of debt from last years sale remains unpaid and commercially precluded many potential buyers from investing this year. Does he have a splint on his off-fore? I was at the sale when your bloke went through robbo and I really felt for you. My mate had a similar result with his filly. 2. Too many of the big studs were using it to get rid of their excess horse flesh after the drought. I inspected a lot of the book 1 horses and it was full of horses that lacked substance and had horrible looking joints/bone structure. 3. Only a couple of the big studs stuck around for book 2. Doesn't send a real positive outlook on the second session for the buying bench. 4. Soooo much hotter at Warwick Farm compared to Newmarket at this time of year. The horses didn't appreciate it and neither did the buyers or vendors. And what does Inglis say? "If you take out the cheapest 200 lots the average wasn't too bad"
I heard Inglis were extremely tight offering terms this year, so that caused the rather poor sale. Doesn’t help the vendors one bit. At $13k you’re better off racing yourself or leasing. In fact, with prizemoney the way it is now, leasing is the way forward if you can’t get a return at the sales. That is what we do with any fillies we don't get a return on. Lease them out, get a chunk of the prizemoney if they do any good and you have a broodmare at the end of it.